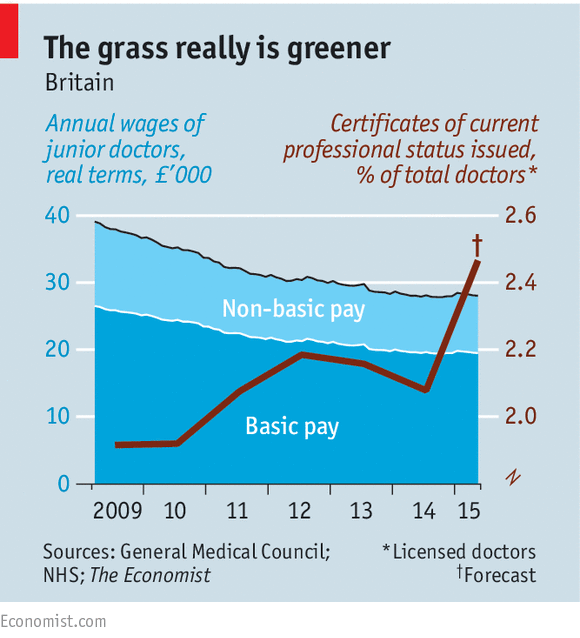 The Economist discusses the growing problem of unhappy UK physicians, "Some junior doctors consider a strike, while others pack their bags". Like workers in any public service, doctors always say that morale has never been lower. But this time many are threatening to vote with their feet and practise overseas. Normally the General Medical Council, which regulates the profession, gets 20-25 requests a day for certificates of professional status, which make it easier to work abroad. From September 16th-18th it received a staggering 1,644 requests.